Photograph of the Teli-ka-Mandir temple under repair at Gwalior in Madhya Pradesh, taken by an unknown photographer around 1882, from the Gladstone Collection. The temple was built in the middle of the eighth century during the rule of the Pratiharas. It is situated in the spectacular fort that rises 100 metres (350 ft) above the town of Gwalior in central India, and is its oldest monument. The temple presents a unique blending of Indian architectural styles. The rectangular sanctuary is covered by a masonry tower 25 metres high, with a barrel vaulted roof. The niches on the outer walls, which no longer house the sculptures, are covered by gavakshas, arch-like motifs, a North Indian type of decoration. The doorway is decorated with carved figures of river goddesses, amorous couples (mithuna), foliation motifs and a flying Garuda on the lintel. 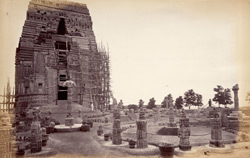 Short inscriptions dating to the 8th century and the surviving images in the temple indicate that it was dedicated to the Goddess.This view shows the temple under restoration in 1881-83, with scaffolding along the façade and the garden sculpture that was created around it during the restoration.